I have been on a Mad Men kick ever since I randomly caught one of the episodes on AMC. The dashing Don Draper with his dark secrets, immaculate suits, and gritty manners that he smoothes over with well-placed words inspired me to create a dish in his honor. So what kinds of food would Don Draper and his slick gang of liquor sipping, smoke-encased ad men enjoy if they truly existed? I thumbed through my collection of antique 1960’s style recipe pamphlets called “Husband Tested Recipes”, eyeing curious recipes like Barbecued Cheese Buns and Whipped Cranberry Dressing, and Bacon Rarebit – yet none of it seemed appealing. But on the very last page I saw “Frozen Lemon Pudding” that looked promising. “Oh no!” it calls for raw eggs, I thought. I guess in those days, salmonella contamination was a rare occurrence. I modernized the recipe by cooking the eggs, cutting some of the fat, and scaling back on sugar. Yet I kept the graham cracker crumbs, because after all it’s good to have a hint of gritty when you’re having something smooth. 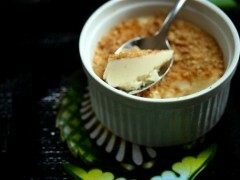 Get my Mad Men Frozen Lemon Pudding Recipe. What kind of carnation milk? Evaporated?